To simplify the plumbing and to reduce cost, the fixtures should be, where possible, located so all piping connections will be made in in one wall and require only one vent for the bathroom. The piping should be in a warm wall so that the pipes do not freeze. An in-swinging door is best if it opens in an area not occupied while using any fixture. It is best to have the door swing against a wall or against the bathtub. 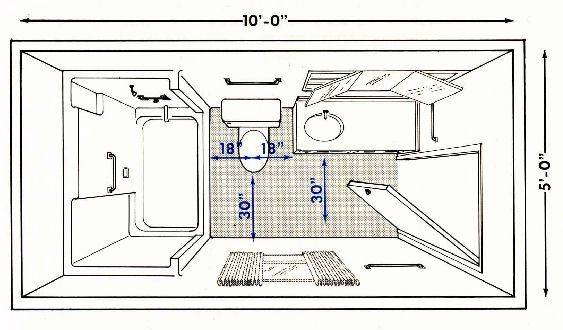 The vanity unit should be located so that an open drawer will not block the door swing, which would prevent someone from entering the room in an emergency. 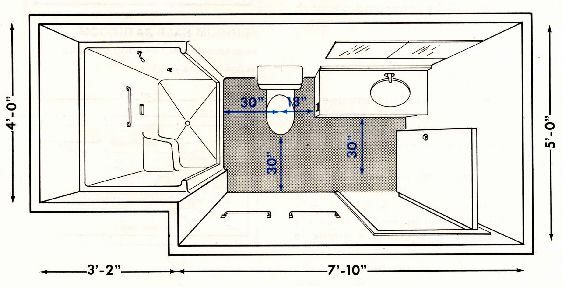 Exhaust fans are required for all bathrooms that have no window that can be used for venting. Fans should be vented to the exterior. Vent pipes passing through an attic should be insulated because the condensation from the warn house air can freeze. This frost will eventually thaw and cause damage to the exhaust fan and surrounding ceiling. 1. Choose the fixtures for the desired use and space available. 2. 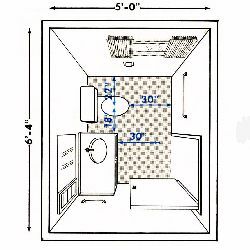 Select the best location for the bathroom, keeping in mind the availability of hooking up to the sewer as well as hot and cold water supply lines. 3. Determine the best location of the fixtures.